None of our set piece events are more eagerly anticipated than the Installation ceremony and Dinner, and this year was no exception. 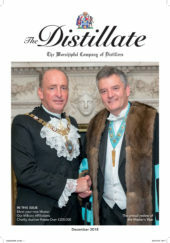 Following the reception and warmed by copious amounts of Louis Roederer champagne, Plymouth Gin, and Jameson Irish Whisky, a full house greeted the newly installed Master, Martin Riley, as he processed into Vintners’ Hall with his newly appointed Wardens, joined by the Mistress, Nicola, sons William and James, and daughters Alexandra and Charlotte. The assembled guests then responded heartily to the toast of “The Master” which was proposed, as tradition demands, by the Immediate Past Master Bryan Burrough, with delicious Woodford Reserve Kentucky Straight Bourbon (it was Thanksgiving, after all!). The evening was already looking promising, and our Honorary Chaplain Canon David Parrott immediately added to the conviviality and good humour with another of his exceptionally gifted Graces. Think of a word that rhymes with “Riley” – yes, our new Master is indeed……?! Both our new Master and Mistress are Francophiles, having studied French at university (Oxford and Cambridge, respectively); they speak the language fluently, they have both worked in France and they have a house there. Accordingly, it was no surprise that the menu and wines had a very French flavour, and a composite tasting note for the Chablis Premier Cru, Crozes Hermitage and Sauternes, embraced the adjectives: youthful, mature, interesting, balanced, and full of style and character. Could the Master have been describing himself, I wonder…? Liveryman James Higgins, proposing the toast to the Guests, welcomed the Master’s Family, as well as Honorary Liveryman Lord McFall of Alcluith, thirteen other new Liverymen, Corporate Freemen John Burke, Ian Taylor and Gian Paolo Leproni of Bacardi, and Mr Eduard Etter, Master of EE Zunft zu Rebleuten in Basel. He also introduced the Master’s guest speaker, Richard Burrows, a long term friend who is currently Chairman of British American Tobacco, and previously Chairman and CEO of Irish Distillers. Richard Burrows responded on behalf of the guests and proposed the toast to the Master, after revealing many interesting facts and amusing anecdotes, and hailing him as one of the world’s greatest marketeers of distilled spirits. What an accolade from such a distinguished gentleman! The Master responded with grateful thanks to his guest speaker, and also used the occasion to express his enormous gratitude, on behalf of the Livery, to the Father of the Court, Past Master Charles Minoprio, for his very personal gift of an inscribed silver gilt Loving Cup, shaped like a whisky glass, engraved with the arms of the Distillers’ Company and Minoprio family respectively, which he had presented at the beginning of the Loving Cup Ceremony. This beautiful addition to the Company’s treasures will now take pride of place at our future functions. The speeches were accompanied by a splendid selection of Dows 2000, Benromach 15-years-old Speyside single malt and Janneau Armagnac – the Master having recently been appointed Capitaine Lieutenant of the British Squadron of La Compagnie des Mousquetaires d’Armagnac. Armagnac is also the destination of the Court trip this year. After the formal proceedings had concluded, some departed for home whilst others joined the Master for a Stirrup Cup upstairs in the drawing room. Thereafter, the Master and some selected guests retired to the Master Vintners’ private drawing room, to enjoy a well-earned after party.